One of spectroscopic instruments core components: a light source <br> <br> In recent years, the development and use of new pulsed xenon lamp has attracted wide attention. Yang Xiaotao and Zhao Youquan introduced their respective pulsed xenon lamps. Yang Xiaotao participated in the â€œDevelopment and Development of High-stability Light Sourcesâ€ in the â€œScientific Instruments and Equipment Research and Developmentâ€ of the â€œEleventh Five-Year Planâ€ national science and technology support plan major project. The project has already been completed and related products have also been industrialized. Zhao Youquan participated in the "Special Application and Engineering Development of Key Components and Components of High-Performance Spectroscopic Instruments" for major scientific instruments and equipment in 2011. At present, prototypes have been developed and its industrialization can be expected. 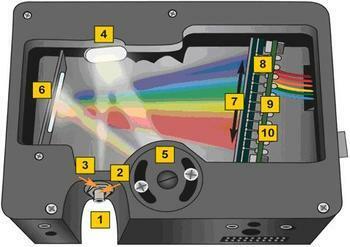 It is believed that these technologies and products provide more options for domestic spectroscopic instrument companies. Take this opportunity, the whole machine manufacturing companies have made suggestions to upstream component manufacturers: UV spectrophotometer and Xenon lamps used in atomic absorption have some differences, it is recommended that Xenon lamp manufacturers take into account production; domestic light source manufacturers should provide products Details of the data; some brands of xenon lamps are difficult to light, element lights drift ... ..., the relevant parts manufacturers on-site to give answers. The core component of the spectrum II: Grating <br> <br> Unlike in the past, the salon will be held in Changchun, and organize participants visited the birthplace of Chinese grating - Changchun Institute of Optics, Fine Mechanics and Physics Institute (Changchun Institute of Optics and Mechanics). In 2007, the National Grating Manufacturing and Application Engineering Research Center was established with the help of the Changchun Optomechanics Institute. The center has 5 grating rulers and 457 grating masters, providing more than 30,000 gratings per year. More than 200. The gratings of most of the domestic spectroscopic instruments were all from the Changchun Institute of Opto-Mechanics. This time, they had the opportunity to directly experience the manufacturing process of the grating and face to face with the person in charge of the grating center. Representatives of domestic spectroscopic instruments companies actively asked questions and sought help. Suggestions for improvement, such as stray light caused by the burr of the grating become larger, and the grating should be numbered for easy traceability. The two directors of the Bayiheshige and Qi Xiangdong of the Changchun Institute of Opto-Mechanics stated that they would actively solve such problems and introduced the problems of raster testing services put forward by enterprise users. The light machinery institute relied on some resources of the original comprehensive analysis center to set up a Test service companies offer a broader range of services that can solve such problems for spectroscopic instrument companies. The core components of the spectrometer III: detector <br> <br> According to the Japanese coast Songfan Shikoku, in 2005 Hamamatsu branch of investment into research and development, production photomultiplier tubes and other products in Langfang, at present, Hamamatsu photomultiplier tube The product occupies about 90% of the Chinese spectrum instrument market. Regarding the discussion of detectors, the first question raised is how to break the dominance of Japan's Hamamatsu photomultipliers in China. According to Deputy Secretary-General Liu Wenyu, there are foreign suppliers of photomultiplier tubes and companies such as British ET. . At present, some domestic companies have begun to develop and produce related products. For example, the photomultiplier tube production line of French Fluxus, which was introduced by Hainan Zhanchuang in 2012, has already been put into production. It is expected to reach an annual output of 230,000 PMTs with different models within 3 years. . Nanjing Huadian also cooperates with Anhui Institute of Optoelectronics to produce photomultiplier tubes, but at present, it is also mainly used in the medical industry. In addition, the Forty-fourth Institute of China Electronics Technology Group Corporation undertook the â€œScientific Instrument-specific CCD Development and Instrument Developmentâ€ special research and development for major scientific instruments in 2012. At present, the project is already under development. In some of the spectrum will be applied to the flowmeter, etc., but the whole machine equipment companies often have problems in selecting these accessories, "high-quality", high performance, many functions, but often beyond the needs of the instrument manufacturers, instead Due to the high prices of these â€œbig thingsâ€, the cost of the entire machine equipment has been drastically increased, which has caused equipment companies to reluctantly give up, and some instrument manufacturers simply produce their own products. In this regard, the flow meter supplier Qixing Huachuang Wang Zhao said, "This time to participate in the salon is to learn more about the development of the analytical instrument industry, as well as our customers - the needs of the instrument company, targeted development of the flow rate for analytical instruments meter." It is suggested that â€œpositioning products should be done before developing products. If it is a general-purpose and conventional product, we can try to use domestically-made devices and make good use of the strengths of each device. Domestically produced products can fully meet the demand.â€ Chen Jiangang, General Manager of Shanghai Spectroscopy pointed out , "Shanghai Spectra is made with domestic lamps and detectors, and its performance is not bad. We can share relevant information and technologies." The cost of key device testing equipment is high, and there are certain difficulties in the ex-factory inspection of domestic component manufacturers and in-factory testing of complete machine manufacturers. In this regard, Wei Dongyuan, a researcher at the China Academy of Science and Technology Development Strategy, pointed out that â€œChina's spectroscopic instrument research and development and industrialization, etc. Without platform support, it is recommended that the sub-association take the lead in applying for the establishment of the Spectrometry Instrument Industry Alliance to achieve the purpose of resource sharing and service for production enterprises.The Ministry of Science and Technology of the People's Republic of China (863) plans to support the establishment of a coalition project each year, with related funding of 40 million RMB. More than 90 industry alliances." As an instrument user representative and an expert in the development of spectrometer instruments for many years, Chen Jianghan, director of the China Center for Analytical Testing in Guangzhou, made suggestions to instrument manufacturers. â€œWe all say that reliability is designed, but domestic instrument companies have almost no product design process. Quality control: Instrument companies should implement standardized production and quality control throughout the entire process, and implement quality management systems such as ISO9001."